Songwriter and vocalist Sierra Hurtt has been performing and recording since the tender age of 4. The daughter of award-winning songwriter, Phil Hurtt, Sierra grew up in the cradle of Philadelphia Soul. During her teens, she discovered Rock 'n' Roll, which led to a period of musical exploration that has resulted in a truly unique sound. In 2009, Sierra emerged as a fresh, new artist with stories to be told and a voice to be heard. With the infectious lead-off single "Rooftops", her debut EP 8 or 80 is catching the attention of critics and audiences worldwide. Though she is often compared to Joni Mitchell, Carole King and Sia - among others - Sierra is carving a niche that is all her own. Aided by the help of long-time friends, including engineering virtuoso Michael Richelle, seasoned, session musician Chuck Treece, R&B chanteuses Gabrielle Hurtt and Vivian Green, and musical chameleon Greenwood, Hurtt is poised to fulfill her legacy as a child of music. FANS - Please checkout Sierra Hurtt iTunes page play / purchase some great new music! RadioIndy is pleased to present Sierra Hurtt with a GrIndie Award for the CD "8 or 80 "
Songwriter/vocalist Sierra Hurtt’s debut album, “8 or 80,” is comprised of crisp and refreshing contemporary pop/rock while highly flavorful with folk attitude. Hurtt, who is no stranger to the music scene, charts her own course into the music industry with a voice that is strong and emotive, and emits qualities of deep, rooted, soulful distinctions. Peaceful and serene comes to mind when hearing “Solace,” with the soothing acoustic guitar and the tranquility in Hurtt’s voice. Laid-back and full of solid vibes, “Rooftops” is embedded with expressive rock guitar riffs that swarm around the sultry vocals that Hurtt generously delivers. A beautiful blend of tingling vocals and thoughtful lyrics meld together with the sweet guitar licks on the gem, “Circles.” Don’t miss a chance to hear this wonderful album, “8 or 80,” especially if you’re a fan of Joni Mitchell or Carole King, because with Sierra Hurtt at the helm, you’re in for a fantastic ride. 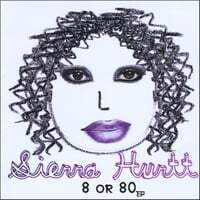 RadioIndy is pleased to announced that we have published our CD Review of Sierra Hurtt music to Facebook. Sierra Hurtt is on MySpace.com! Sierra Hurtt Press Release on Digg.com! "8 or 80" Reviewed by RadioIndy.com! An addictive blend of acoustic soul and adult contemporary rock with Indie pop sensibilities. Recommended if you like Joni Mitchell, Sia.